The Peacock Royal is more often spotted in urban parks and gardens than in the forested areas in Singapore. This may be because its caterpillar host plant, the parasitic plant Dendrophthoe pentandra, which it shares with the Painted Jezebel and Green Baron, grows rather commonly in secondary and planted greenery in urban areas. 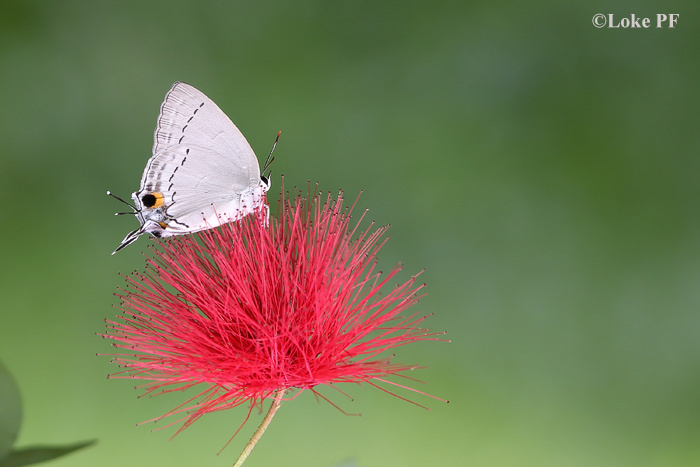 It is often observed feeding on flowers of the Ixora and other garden plants. The Peacock Royal is moderately common, and where it is found, several individuals can often be seen together. The upperside of the male features a beautiful royal blue with jet black apical borders. This shot, taken by ButterflyCircle member Loke PF, shows a male Peacock Royal perched on the flower of a Calliandra bush (often called the Powderpuff flower).